We were fairly bemused by Sony's Vaio Fit range when it launched at IFA last year, and now the foldable origami-inspired tablet/laptop hybrid will be coming in a 11-inch version. The Sony Vaio Fit 11A joins the 14- and 15-inch editions that were already announced, and the whole line-up will also be getting a juicy bit of Photoshop action, with Elements 12 coming pre-installed on each machine. The Fit range lets you use the device as a regular laptop, a tablet or in 'viewer mode' which basically means as a tablet on a stand that's built into the bones of the device itself. The Vaio Fit 11A comes rocking a Triluminos display and ClearAudio+ for what Sony boasts to be top notch film watching. There's also a front-facing camera for video calling and selfies, and an 8MP Exmor rear-facing lens. The 11-inch device weighs 2.82lbs (1.2kg) which is a fair bit more than a stand-alone tablet (the iPad 2 is 1.33 pounds/601g, for example) but still not exactly back-breaking. 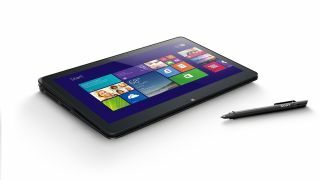 The tablet/laptop comes with a stylus which should go quite nicely with that Photoshop software you'll get with it too. On the inside, we're looking at an Intel Pentium quad-core processor and SSD, although the exact specifications will vary according to how much you pay. The Fit range will be hitting the US from January with prices starting at $579 (we're waiting on international availbility but that works out as about £352 or AU$646).